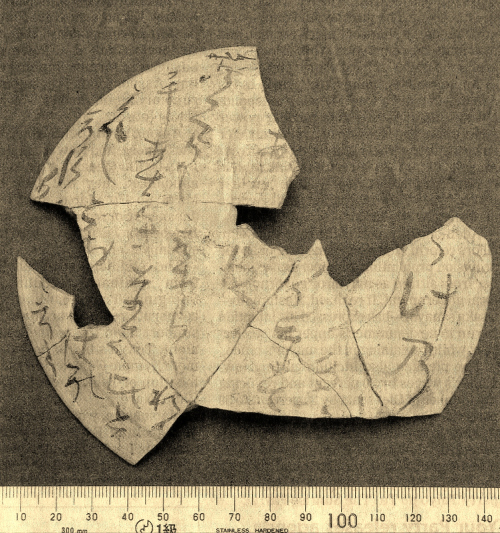 Earthenware fragments from the late ninth century that bear hiragana calligraphy have been discovered in the ruins of the building of a noble who lived during the Heian period (794-1192) in Kyoto, the Kyoto City Archaeological Research Institute has announced. Modern hiragana is closer to the calligraphy on the discovered fragments than characters from the early 10th century that were believed to be the oldest, evidence that hiragana characters were created at least five decades earlier, the institute said Wednesday. The find constitutes precious historical material for the history of the Japanese language. The fragments were found at the ruins of the house of Minister Fujiwara Yoshimi (813-867) in November 2011. According to Kyoto University Prof. Ryohei Nishiyama, who analyzed the calligraphy, it can be read “Hitonikushito omoware.” Hiroshi Sano, an associate professor of the university, explained it meant annoying yet adorable. The origin of hiragana was Manyogana, kanji that represented Japanese phonetically. Until now, hiragana was believed to have been established in the early 10th century, when an Imperial-commissioned poetry anthology, Kokin Wakashu, and diary Tosa Nikki, were compiled. The earthenware fragments are scheduled to be displayed at the Kyoto City Archaeological Museum from Friday to Dec. 16.